Meet Keshav N! Keshav joined us in grade 5 from a local private school. Keshav was familiar with BASIS Independent Silicon Valley (BISV) as his older brothe r joined us as a student in grade 6 the year the school opened. He had a solid idea of what BISV was going to be like before he enrolled, and once he was on campus his brother was a big help and shared lots of strategies. He was initially nervous about the workload, but his teachers "were very communicative and helped a lot" he mentioned. He thinks that it has been easy to make friends from the start, but that over the past few years, he has especially enjoyed seeing more of his friends from his previous school join BISV. Keshav starts his day in English with Ms. Angkham where they are currently reading The Diary of Anne Frank. When the class began reading the book, one of their first assignments was to write an essay on vigilance and how it related to the time period. A typical day in English starts with Bell Work, which are brief warm up activities. The week is usually broken up by three days a week focused on grammar, and then two days a week focused on literature. Keshav feels that as his previous school gave him a great foundation in grammar, and since Ms. Angkham is so helpful when he has questions, that he rarely needs to use office hours for English. After English, Keshav heads to U.S. History with Mr. Bennett. They have just finished learning about the American Civil War and are beginning to study the Reconstruction Era. Keshav appreciates that Mr. Bennett uses nontraditional examples to teach his students. Keshav went on, "He will use an example that you wouldn't typically think of. For example, Mr. Bennett will explain that a concept is like a golf course in a desert. What he means, is that you have to keep working on it, because the moment you stop watering the golf course, the desert comes back. An example like this would describe something that requires a tremendous amount of effort to keep things going the way you want." These types of examples stick in his mind and he remembers things that way "because they are kind of weird." A favorite aspect of Mr. Bennett's class is that they play fun review games. Keshav likes working with his peers, and learning in an interactive way. Depending on the day, Keshav has either Chemistry or Physics. All students in grade 7 take three separate science courses: Biology, Chemistry and Physics, and their schedule rotates daily. On some days, Keshav heads over to Chemistry with Dr. Vervoort. The class is currently learning about ionic bonding; the transfer of electrons and the different bonds that can be created. He is amazed that different materials can affect every day activities. When I asked Keshav to give me an example, he explained "NACL (salt) can dissolve in water just because of its structure, and another element couldn't do that. I think that is really cool!" Keshav's favorite lab so far this year was on Halloween, when they used dry ice to create foam. He really enjoys the sciences a lot, which is clear when he talks about these courses-he just lights up explaining the concepts. If it's a Physics day, he joins Mr. Rocha's class. Physics happens to be Keshav's absolute favorite course, and has been for the past two years. 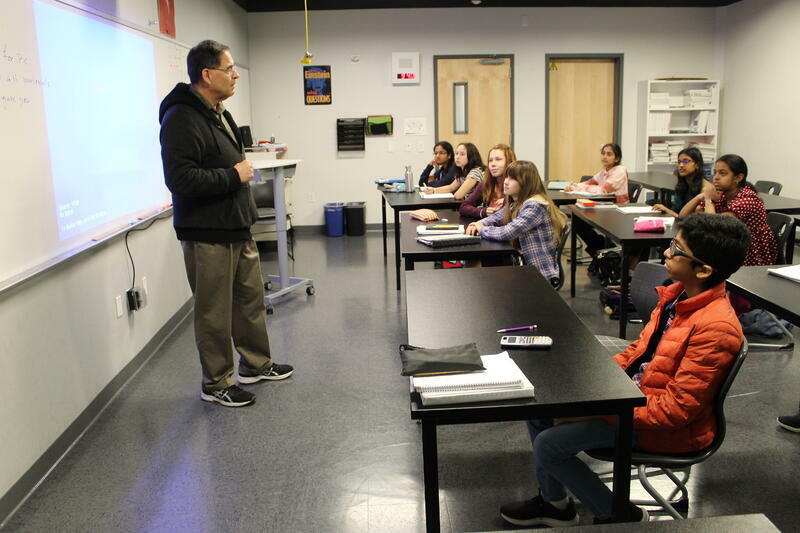 Mr. Rocha has spent a lot of time this year on Newton's Laws, as there is a wide variety of topics to cover and learn about motion. Physics can be a hard class. They typically have a few pages of homework after each class, so preparing for everything can take some time. "You need to determine which concepts are needed to solve the questions, if I'm not sure about the answer I can go to office hours for help." Next up, Keshav goes to Pre-Calculus with Mr. Kaufman. Mr. Kaufman is his favorite teacher this year, because "he has so many creative ways to solve problems. For example, we're not just learning trigonometry, and different ways to learn identities, but we're also learning about logarithms, and how to factor them instead of dividing them. " 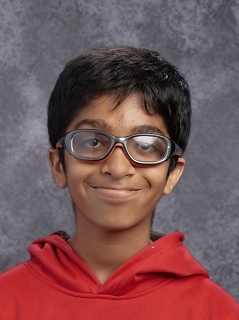 Keshav continued that by being creative in his approach, "Mr. Kaufman pushes us to learn about the many ways to solve problems so that we are comfortable with finding multiple solutions. " If he doesn't understand concepts, Keshav will often go to office hours, because "Mr. Kaufman is really helpful. We also get a review packet every Friday as he wants us to think about different examples so we understand the material." After Pre-Calculus, it's time for lunch! His favorite way to spend his lunch hour is to play basketball. Keshav really enjoys playing with different students as well as his friends. He will sometimes go to Latin office hours during lunch. Once lunch is over, he attends either Logic (a class taken by all students in grade 7), or Biology. In Logic with Ms. Jefferson, they work on outside the box thinking. A current topic is logical operators, or different propositions to see if different themes are equivalent. They have also worked on a variety of riddles as a class. Keshav enjoys the class. The laws they have learned about so far have already made an impression on him. "I enjoy looking at the laws in a combined way to create a working scenario." On Biology days, Keshav heads to the lab with Mr. Barnes. Keshav explained that one of the best things about Mr. Barnes is that "he makes the class like a conversation. We're not getting lectured at, there is discourse between him and the class. We recently finished protists, and will begin to learn about Fungi today." The labs where they first learned how to use microscopes were some of Keshav's favorite. "Seeing blood cells under the microscope was amazing, especially when you compare them to drawings in textbooks." Keshav says that Mr. Barnes is always available and that he will go to office hours for extra review for a test or quiz. After Biology, Keshav has Latin with Ms. Odell. 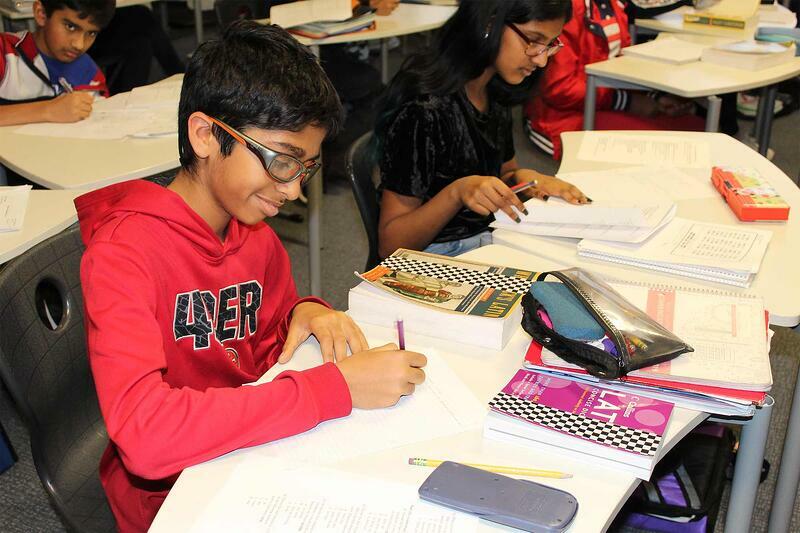 When it came time to select a World Language, Keshav decided to stick with the Latin that he had been learning in grade 6. In grade 7, students are able to diversify and choose French, Spanish, Mandarin or Latin. Any student who was at BISV for grades 5 and 6 has experience with Latin, but not all wish to continue with it. Keshav's older brother stayed with Latin, so Keshav decided to do the same, as he liked the idea that he had "built-in tutoring at home." In class, they are learning about irregular nouns, and all the different ways to identify them. Keshav explained "The grammar isn't harder than English, just different. It's easier to determine nouns in Latin as it tends to be more systematic than English." Even though Latin is definitely a complicated language to learn, he really enjoys Ms. Odell. He continued "she is a really nice teacher, and she's great at making funny jokes that relate to the subject, but keeps us on topic." He finished that "Ms. Odell is one of the most enjoyable aspects of the class." Keshav ends the day with his elective, Drama with Ms. Sweet. He had never taken a class like Drama before, but he's learning that he likes to be on stage. He was very nervous about performing at the beginning of the year, but they did so many auditions that everyone is excited to perform now. The 7th Grade Showcase is coming up, and he plays Marco. Keshav explained the role to me and said that "they try to earn money by putting on acrobatic shows, but we are basically con men." He enjoys many things about Drama "It's a break from the books, and it's fun to play a part that is really different than my own personality." Keshav is a big part of our community, and we look forward to seeing how the rest of grade 7 is for him!